I remember once going to an Asian Farmer’s market when I lived in Sacramento excitedly and frantically throwing exotic looking fruits and vegetables into my basket. I had no idea what most of them were or how to prepare them and while I did make a few recipes, most of my market booty ended up in the bin and I ended up feeling very guilty. Turns out that even the fruits and veggies we eat on a regular basis have much more to offer our plates and our stomachs. 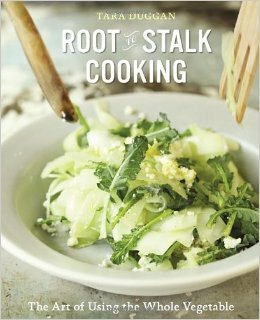 In her book, Root to Stalk Cooking Tara Duggan highlights recipes that ensure we’re getting bang for our buck from the store while also keeping unnecessary waste out of the landfill. According to the United Nations Environmental Program Americans waste up to a third of all food produced and in the USA organic waste is the second highest component of landfills, which are the largest source of methane emissions. So what can I do, I hear you ask? Well, for a start you can eat your veggies-most, or in some cases all of them. The recipes contain ingredients you probably already have on-hand; oil, vinegar, herbs and common grocery store items. One great negative in cook books for me are ingredients that are obscure or difficult to find, or that the recipes are too complex to execute. This book is both accessible and easy to follow. Did you know you could eat carrot tops, chard stems and potato peels? Gross? No, really good actually. As gardening season is beginning to get under way, Root to stalk cooking is a great resource to prepare recipes where most of the vegetable and fruit can be used. Arranged according to the vegetable part; roots, bulbs, leaves, flowers, seeds and fruit, author Tara Duggan showcases 65 recipes that maximize vegetables to their fullest potential. Veggie scraps and obscure organic anatomy may at first seem strange to cook with, but so were ugly fruits and veggies and now they’re becoming pretty trendy- who doesn’t love a carrot with personality? Though there were some recipes I would not prepare, there are many others that are a great way of using scraps. I have tried the Chimichurri, the Carrot top Salsa Verde and the Celery slaw with Apple peel and Ginger dressing and they are all delicious. Remember the old adage waste not, want not and give these recipes a try. The author is an award-winning journalist for The San Francisco Chronicle and covers food policy, trends in home cooking and has written a food column for the Chronicle for the past 11 years. Creative Gardening Series: Planting for Pollinators!